Melissa and Brian are Fun In The Sun Weddings’ newest newlyweds! This bride and groom have the luck of the Irish on their side, with the four leaf clover a prominent feature woven throughout their love story. Melissa and Brian met on St. Patrick’s Day. Brian and his friends were raising money for charity at the bar where Melissa worked. A donation earned you a shamrock that you would write your name on, and then stick to the bar. Brian, obviously a charitable opportunist, donated five bucks, wrote his number on a gold shamrock, and slapped it on the bar. Melissa secretly memorized it, and the rest is history! Brian proposed to Melissa on St. Nick’s (December 6th, 2016) without knowing that it was coincidentally the same day that Melissa’s parents had gotten engaged themselves 33 years prior! Nevertheless, Melissa did not see a proposal coming, and after an exhausting weekend of holiday parties she woke up to a shower of beautiful gifts from Brian. One box which she thought held a watch, turned out to be her engagement ring. When she tore it open, she found Brian down on one knee, with his proposal written on what? A shamrock of course! Aw, lucky girl! 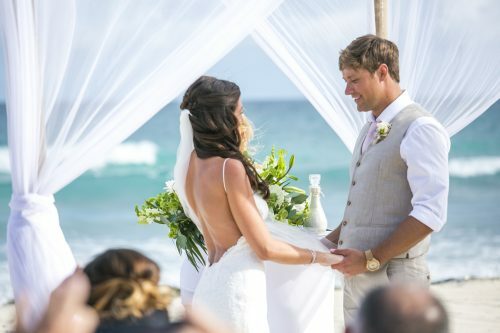 This Bride and Groom always knew they wanted to get married on the beach, and a destination wedding seemed like the perfect way to extend their big day into a week of fun with their favorite people. 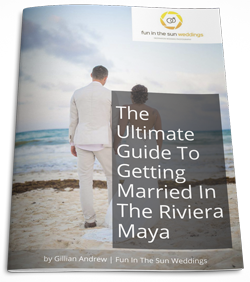 They fell in love with the Valentin Imperial Maya Resort, where Leslie and her on-site wedding team created the simple and elegant wedding that the couple envisioned, allowing the beauty of Mexico to add the perfect pop of color. 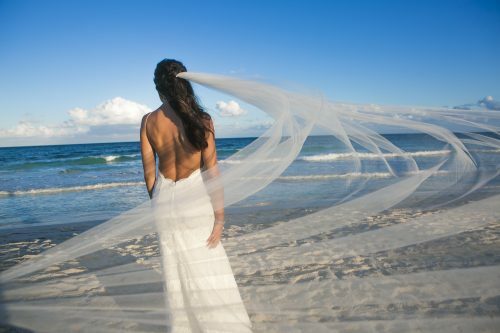 Melissa’s hunt for beach wedding dresses began on Pinterest where she went wild for a dress from a designer in LA. Believing it could never be hers, imagine her excitement when she walked into Alice in Ivory bridal boutique in Chicago and saw the very same dress! It was her dream wedding dress was literally my dream dress, and she’s currently trying to figure out when she can wear it again. Enjoy your wedding day, it goes by so fast! I didn’t believe it would, but it did. So have fun! Melissa and Brian, we know that you already have luck on your side, but we still want to wish you all the best in this next chapter of your lives together! Congratulations! 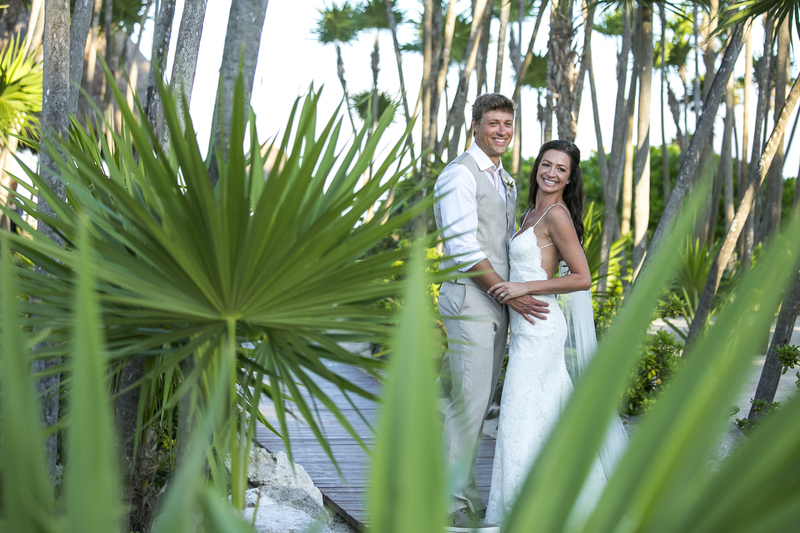 If you are looking for the best Playa del Carmen wedding photographer, then contact us today. 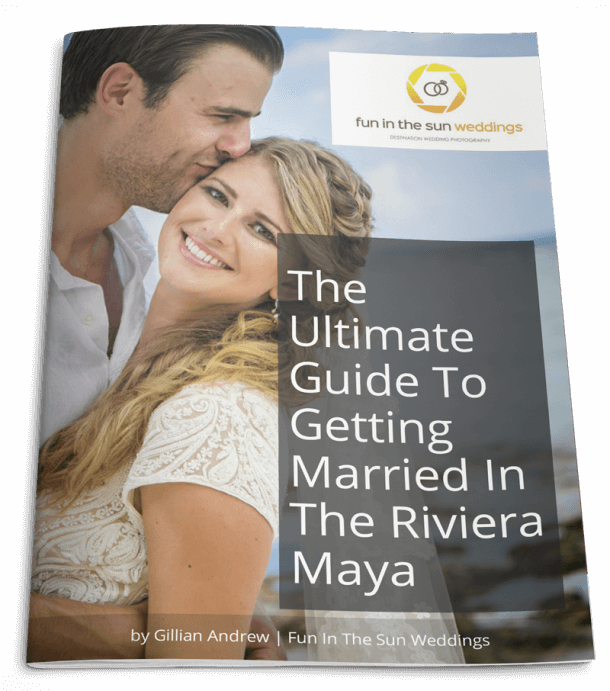 We are Fun in the Sun Weddings, the best wedding Riviera Maya wedding photographers. Want to know more about the Valentin Imperial Resort? Read unbiased reviews on Tripadvisor here. Thank you so much! We had a blast shooting with Marc and Shari, they were a blast and so amazing!